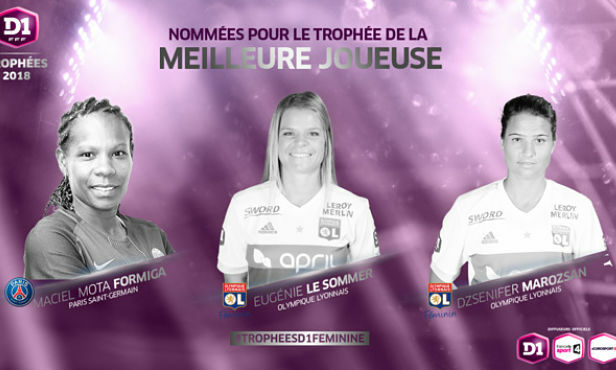 Three OL players are nominated in different categories of this year's D1 Féminine Awards. Following the UNFP Awards, which saw Dzsenifer Marozsan named Female Player of the Season, the FFF (French Football Federation) is hosting the D1 Féminine Awards this Sunday at 18:30 local time. The German international is among the nominees for besgt player, as is Lyon teammate Eugénie Le Sommer. Selma Bacha, meanwhile, is nominated for the Best Young Player award. Finally, Ada Hegerberg and Kheira Hamraoui are in in the running for Goal of the Season.